Building Performance Tracking Through Energy Analytics | PCD Engineering, Inc.
Tracking the performance of your facility investment is no different than any other asset. It is part of sound operations process, it can identify improvements, verify performance and insure savings persist over time. Improving building performance continues as one of the highest return, lowest risk investment opportunities and helps commercial real estate organizations reduce operating expenses, increase property asset value, and enhance the comfort of their tenants. Building energy systems often consume approximately 15% more energy than is necessary due to system deviation from the design intent. And even with powerful aid of building automation systems, identifying the root causes of energy waste in buildings can be challenging. And energy waste often goes hand in hand with comfort and air quality issues in buildings offering an opportunity to solve nagging facility issue that boost tenancy and production. Even when buildings are ‘tuned-up’ to operate better, performance can drift over time. Energy drift is the concept that buildings do not perform, from an energy consumption standpoint, as well over time as they did when they were first built. As much as 10-30% of maintenance costs can be incurred due to energy drift if a building performance is not analyzed and optimized over time. This holds true for any building, regardless of its age or green building certification. Similarly, a building energy manager or sustainability team might initiate an energy efficiency project or commissioning in an attempt to get their building back on track. While this holds well for a short time, the drift begins again until comfort problems of utility cost escalate to a point where another project is implemented. So what can you do if you don’t currently track your performance? A good first step is to benchmark your building or portfolio of buildings. Benchmarking is the practice of comparing the measured performance of an organization, facility, end-use or device to itself, its peers, or established norms such as a reference building or code compliant building. For your buildings, you may compare your energy costs or top customer comfort or operational complaints from one year to another or compared to similar facilities. In doing so benchmarking can help select which buildings to target for improvements. Currently the City of Denver under its Energize Denver program is requiring benchmarking. And municipalities around Colorado and the nation are also requiring it. Benchmarking gives you the big picture, and while it’s a good snapshot start, it’s not so good at detecting problems early. The ENERGY STAR® Portfolio Manager is a popular, free tool for benchmarking your facility. Contact a building consultant such as PCD Engineering to get started. 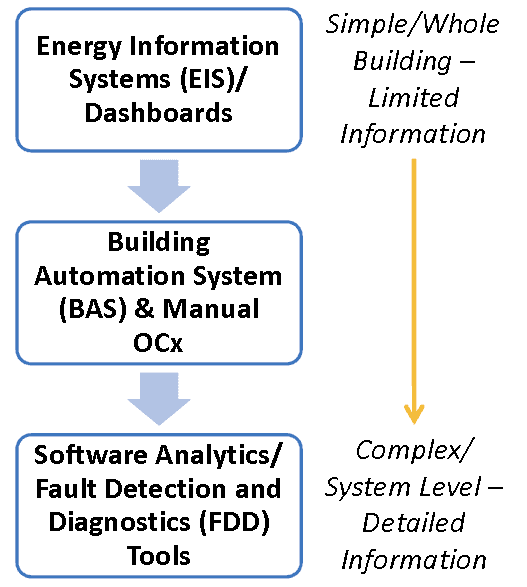 To track facility performance at a systems level and further help improve comfort and operating costs, building operators or facility managers often to rely on building automation system (BAS) to keep things under control – but an automation system is not enough to reach optimized building energy performance. In order to help best address the challenges in maintaining performance, building automation systems should be combined with energy analytics to generate a real-time, whole building energy diagnostics and performance monitoring system. The proposed system continuously acquires performance measurements of heating, ventilation and air-conditioning, lighting and plug equipment usage and compare these measurements in real-time to a reference expected design condition or acceptable performance. Energy analytics tools, also known as fault detection and diagnostic tools, automatically detect faults and may help diagnose of the cause of the fault. The tool is often an add-on software program to a building automation system, and monitors system data from the building automation system. It not only can identify problems, but also rank the problems with respect to energy, comfort and cost impacts. Automated detection of faults saves time, finds those hidden problems and gives operators more information on a problem and its potential cause. Energy analytics tools also offer integration with utility bill tracking/benchmarking software and work order systems making them even more useful. Our clients prefer deploying these tools using software as a service due to lower up-front cost ease of installation external support versus purchased platforms. Energy analytics can be combined with Energy Information Systems or Energy Dashboards which are broadly defined as performance monitoring software, data acquisition hardware, and communication systems used to store, analyze, and display building energy data. Like the dashboard on your car, they provide a glimpse of key performance indicators and may incorporate a “check engine” light, but lack of level of detail or sophistication on where to act for improvements. They typically provide utility building level data and are useful as marketing or communication tools for building performance to tenant, customers and staff. Buildings that are prime candidates for energy analytics include any building with a building automation system. When implementing such a program, make sure you have the organizational capacity to analyze data, act on alerts and document actions. Consider hiring a building energy consultant to assist developing a program that’s best for your organization and consider utilizing the vendor for monitoring and analysis as they have an understanding of the software that will help streamline implementation. Energy analytics is beneficial at the single building level. They become even more significant when used across multiple facilities and geographic locations. Real Estate Investment Trusts (REITs), large organizations with nationwide portfolios and facility management organizations are just several of the organizations needing to evaluate energy usage at a large scale and energy analytics can handle the bid data. So whether you have a single owner occupied facility or nationwide portfolio, make the best of your investment by keeping your facility tuned and operating at peak performance utilizing energy analytics. Your customers, staff, tenants and shareholders will thank you.